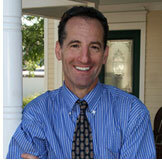 Another Day of Volunteer Teaching and Donating at Local Public Middle School - Abrams Landau, Ltd. Prior to teaching constitutional law and Civics last month, attorney Doug Landau made a special stop to see Courtney Krsmanovic. She is the sole social worker from the Department of Special Services for Fairfax County at the Rachel Carson Middle School. 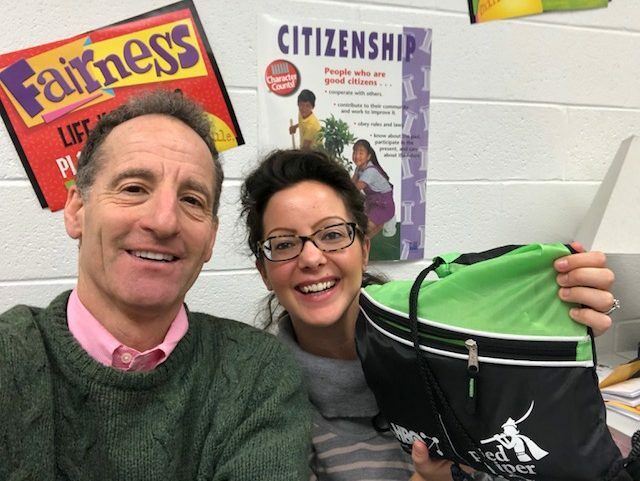 Landau stopped by, as he promised he would, in order to drop off candy for soldiers as part of the charitable program after Halloween at this Fairfax County Public Middle School. He donated a backpack of candy to be distributed among members of our Armed Forced currently deployed. Landau made it just in time as the school social worker was about to leave to go to Hutchison Elementary School in Herndon, Virginia. Crash injury lawyer Landau distributes bicycle helmets to elementary school students and teaches them about traumatic brain injury and bike safety for his Lids on Kids program. Landau then went to his We the People class in order to help the students who just competed in regionals over the weekend to perfect their presentations in the hopes of making a run at the National Championships for the We the People Constitutional Law and Civics competition.